August 10, 2013, Victoria, BC (ISN) – It was hot inside Bear Mountain Arena Friday night for game 3 of the WLA semi final series between the Shamrocks and the Burnaby Lakers. Things got hotter on the floor as the game went on, as the Rocks gave what can only be called a ‘whuppin’ to the visitors, handing them a 17-3 loss. Starting goaltenders were Matt Vinc for the home team and Dan Lewis for the visitors. Burnaby was supposedly desperate, down 2 games to none and the first period was pretty tight, with some great end-to-end action. The Shamrocks went ahead on a bullet from the dotted line off the stick of Rhys Duch at the 4:06 mark. Cory Conway made it 2-0 Victoria with a similar shot at 6:55. Burnaby got on the board at 7:20, Dane Stevens getting in close but a little over two minutes later Jeff Shattler regained the 2-goal lead when he scored late in the 30-second clock with a shot that went off Lewis’ shoulder into the top corner. Victoria capped off the first-period scoring at 17:01 when Jr. Shamrocks call-up Brody Eastwood connected after Karsen Leung did some great work to get the ball out of his own zone. After 20 minutes it was 4-1 Victoria with the Lakers actually holding a slight edge in shots on goal by a 12-10 margin. The second period was what can only be described as a shooting gallery as the Shamrocks scored 7 times on 20 shots, while allowing only 11 shots at the other end resulting in just a pair of Burnaby goals. Things also got a little silly in the penalty department after just 3 minor penalties were called in the opening frame. Both referees were from the mainland but knowledgeable fans wondered if they were from Mars as nobody knew when they would call anything and what it might be. Scott Ranger opened the scoring in the middle frame for the Shamrocks, moving across the crease at 2:25 with the teams playing 4-on-4. Burnaby replied at the 5-minute mark when Casey Jackson put a ball off Vinc and inside the post. Within the next 38 seconds Victoria managed two goals, Tyler Hass scoring at 5:19 and some of those other hard-working ‘d’ guys getting together as Dan MacRae converted a pass from Scott Carnegie at 5:38. The Lakers managed one more goal at the 11:13 mark, Shaun Dhaliwal getting in close but that was all she wrote for the Lakers’ offense. The Rocks rattled off 4 unanswered goals before the period ended as Ranger and Hass each collected their second of the contest and Corey Small added a pair, including one on the power play. The score after 40 minutes was 11-3 for the Shamrocks. Lewis was relieved by Jr. ‘A’ call-up Spencer England in goal for the Lakers at the 16:09 mark. Despite a large number of penalties, only the one Victoria goal came on the power play. Victoria did all the scoring in the final period as things got even hotter on the floor with numerous scuffles, fights, a few game misconducts thrown in for good measure. Most of the goals came in the first 5 minutes. Conway collected his second on the power play at 1:33 with a bullet – he can fire the ball. Eastwood got his second at 3:30 and a couple more defensive guys connected at 3:59, Matt Yager getting the ball on the run from Reed MacPhail. At 4:30 Small picked up his hat trick marker unassisted. In the second half of the period things got really out of hand. There were a couple of fights that could be perhaps considered heavyweight battles as Burnaby’s Matt Beers tangled with DanMacRae. Beers came out the loser in terms of penalties as he was charged with being the aggressor. Then Scott Rouse got into it with Victoria’s Greg Harnett. Harnett got the extra 2 minutes but seemed to score more punches. With 1:12 left in the game, the fisticuffs were not quite over as Tyler Burton of Victoria and Shaun Dhaliwal went at it. Matt Flindell replaced Vinc in goal for the Shamrocks at the 11:15 mark and didn’t allow a goal. 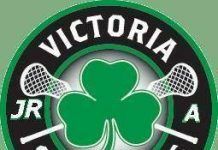 The final two Victoria goals came off the 2 Jr. Shamrocks as King tallied at 16:15 and Eastwood picked up a hat trick at 17:58. As it was in game 2, the scoring was spread around for the Shamrocks. Corey Small and Brody Eastwood each picked up a hat trick and 2 and 1 assist respectively. Tyler Hass picked up a pair of goals, as did Scott Ranger and Cory Conway, adding 2 and 3 assists respectively. Singles came from Matt Yager, Rhys Duch (with 3 assists), Dan MacRae, Jr. Shamrocks call-up Jesse King (with 3 assists) and Jeff Shattler (with 2 helpers). Transition specialist Karsen Leung chipped in 3 assists and was masterful in a penalty-killing capacity and even goaltender Matt Vinc got on the scoresheet with a couple of assists. Scott Carnegie also had a couple of assists. 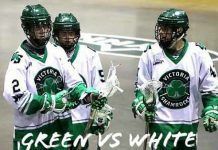 There appeared to be no weak link in the Shamrocks lineup – they moved the ball well, scored from everywhere and gave Vinc and Flindell strong defensive support to take a stranglehold on the series. Officiating was some of the worst seen in recent memory. No doubt they aren’t used to working in front of 1500-2000 fans when the mainland teams are lucky to draw 500. Perhaps they were nervous but some blatant high-sticks were not called and it appeared at times the Lakers main intent was to cause injury – they clearly weren’t playing lacrosse. Bad blood is boiling for sure. The Shamrocks can wrap up things with a win Sunday at Copeland Arena in Burnaby Sunday. In the other series, Langley is looking to sweep Coquitlam as they play game 4 Saturday in Coquitlam.